Industrial exposure plays a very important role in shaping up a career of a student who is pursuing a professional degree. It is considered as the integral part of the syllabus as the industrial exposure provides an insight to the students about the functioning of the industries. Majority of educational institutes in India are adopting industrial exposure as an advantageous method of learning for professional students. Gone are the days when bookish knowledge was sufficient but in the growing competitive world practical knowledge and hands on learning is extremely essential for the holistic development of the students for various business projects. In today’s world only gaining theoretical knowledge is not enough for making a good professional career, in order to go beyond academics, industrial exposures are introduced in the curriculum so that students get a practical perspective about the work at the industrial level. Currently there are millions of students going to college, India has one of the largest system of education. Students are now going towards more professional courses, earlier much more emphasis was given theoretical knowledge but today focus is shifted towards providing practical learning. Nowadays students from any stream have various career options in different fields, it is equally important for them to get industrial exposure before getting into the shoes of professional life. The college and the faculty plays a very pivotal role in making their students prepared enough to face the corporate challenges now in the present scenario most of the colleges are focusing much on the practical aspects of various education other than just theoretical knowledge so a student must go for a college that holds a good record of industrial visits, there are many top engineering and MBA colleges in Mathura, that provides good industrial exposure to the students. Besides providing quality education now the modern era institutes are trying to expose their students to industries making them industry ready. The industry exposure enhances the students work life by adding enthusiasm and the zeal to learn more, it provides a memorable experience and an opportunity to work in the profession in which they aspire to work. So before the student graduates he/she is already trained enough to get a job, which in turn increases their employment chances. The industrial exposure can benefit the employers as well because they may get various benefits from the students such as good support, fresh ideas and young energy that the students bring to the work place. While conducting internship programs allows the organization to develop various leadership and mentoring skills, create an exposure for the company and bring new and creative ideas into the work place. Industrial exposure fulfills the gap between the theoretical learning and practical learning in the work environment. Industrial exposure provides an opportunity for interactive learning experience in classroom and beyond it. Due to industrial exposure students are more aware about the latest industrial practices and industry regulations. With the industrial exposure students gets a clear vision and are able to identify their arrears of interest in which they want to work in an organization. 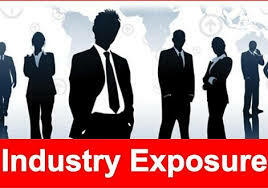 Industrial exposure enhances communication skills, interpersonal skills and personality development. For the students pursuing professional degree the industrial exposure provides them hands-on training experience about how various things takes place in a company.